The Soweto marathon was my very first half marathon last year, so I was determined to do it again this year. Now you know how I’ve been struggling with injuries this year, right? Well, I’m happy to say that I did this without any pain!! So I’m officially back in the land of the running. Not to stay in touch with people, but OMW I missed taking photos along the route! I saw so many things I would have liked to take photos of. All the photos (other than the one with my time and medal) in this post are Sam’s. We may not train together, but she’s just the shizz to run races with. She’s actually a stronger runner than I am, if I look at her training times, but we tend to push each other at races. Sam is recovering from an injury, just like me, so we knew before we started that this was probably not going to be the fastest race ever. I was thrilled when she said she needed to walk at times during the race, it was exactly when I needed a break. In the end, we didn’t do our best 21km time ever, but we finished and I enjoyed the race immensely. Old Mutual and Nike did an amazing job with the race this year. The parking was 100 times more organised than last year, we didn’t have to walk for miles before and after the race. There were proper portaloos… the exec kind with loo paper… that may sound funny but OMW it makes the world of difference. I didn’t have to stop heaving while on the loo! Afterwards there was plenty of places to get drinks and food. It made the whole morning more enjoyable, and I didn’t feel like I really needed to get home. I’ve never run a race in heat like that. At 4am it was 24 degrees celsius already, and it was easily in the early 30’s by 8am. I don’t normally drink coke before the 15km mark, but I needed the sugar from the 6km water point already! The only downer with the organisation, was the missing water point at 15km. Every other water point was proper, with cold water sachets and plenty of coke. There was a water point at 12km… and then nothing until 17.5km and then another one at 18km!! Crazy! We were gasping by the time we got to that water station. I reckon I would have had more of a sense of humour about it, if the missing water station had been earlier in the race… but in that heat and on that hill, I needed it to be at 15km! The Soweto residents literally saved my sense of humour with the failure of a water point. There were so many residents standing in the streets with their hosepipes, hosing people down and letting the runners fill up water bottles and drink from the hoses. Not sure how I would’ve got to the next water point without them. Thank you! I loved the new route. 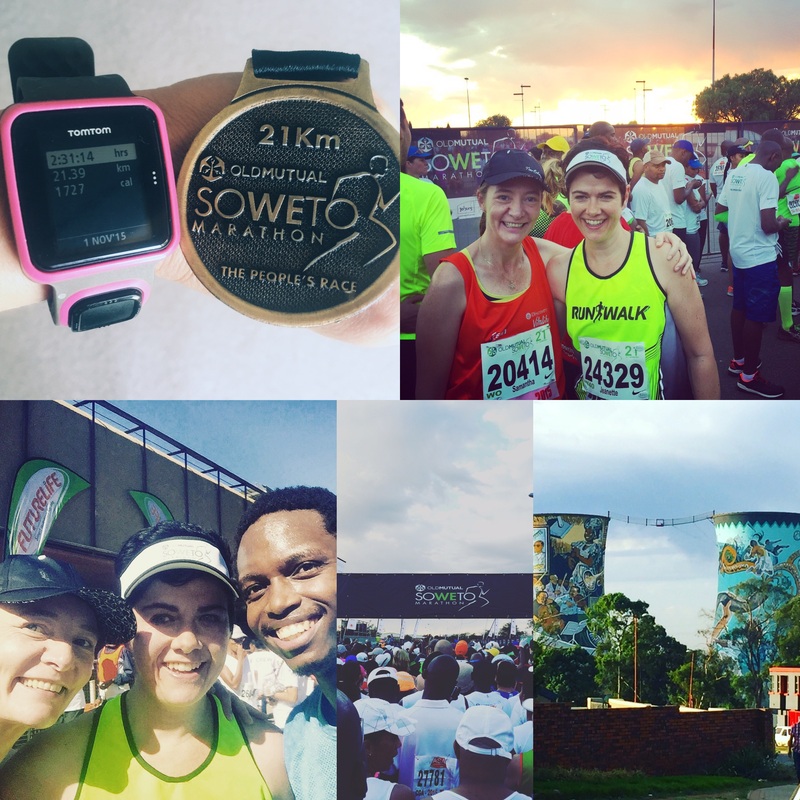 My complaint about last year’s race was that half the route wasn’t in Soweto… well, I can’t complain about that this year. The new route, although not easy with the last half being entirely uphill, went right through Soweto. I reckon if I’d trained properly, and if it wasn’t so hot, that I’d be able to do a PB on that route. At about 20km, a guy tapped me on my shoulder while running, and asked whether I was “The Real Jenty”. Imagine?! That was not something I expected to happen! LOL! Atlegang then said that he blogged as That Indie Runner! I still can’t believe he recognised me, and it was so cool that he said something. Sam and I then ran with him to the finish line… and took a obligatory sweaty finish selfie. The support from everyone in the club is amazing. When I did my first few races, I was generally the only one from the club running, so it was pretty lonely at the RWFL tent because I didn’t know anyone in the other branches. But now it’s fabulous! There are so many of us from Rand Park that run in the races, and we support each other so much. There was loads of sweaty hugging and high-fiving going on when Hilary finished in an amazing time, and Kathy, Jessica and Vikki finished their first 21kms! I love it! We did have a bit of drama at the race, because we didn’t have a club tent set up. Which is very very odd considering it was such a big race. So, we made a plan. Vikki’s parents were at the race to support her, so we found an enormous tree for them to sit under, and they watched all our tog-bags. When we got in from our run, they were able to walk to the finish area to watch Vikki finish her race. It’s one thing doing a 21km. It’s another thing entirely to do a 42km race. I take my hat off to the runners that train for longer distances. We were watching them run in, and I was in awe. Not sure I’ll ever do that. I was keen to try, but now I’m not sure. The chocolate milk and snacks that I’d packed saved me at the end of the race. The flip flops and change of t-shirt was the best idea ever! Thank goodness I’d packed the bag the night before, and just had to grab it on the way out the door. Awww, looks like such an awesome race! And so happy that you ran pain free – yay!! And that you ran into Atlegang – how great is that? Well done, J! Well done again! This was by far my most difficult 21km to date and I seriously regretted missing so many training runs – and ALL my LSDs… I’m glad I finished but my competitive side just feels like a loser! Hope to see you at Dis-Chem! I feel the same way. It was really really difficult! Am sure it was the combo of heat and not as much training as I should have done. If you look at the elevation, in theory it should have been my fastest race… however, 10km of uphill at the end of a race is not for sissies! See you at Dischem, this time I’m walking down that hellish hill and not buggering up my knee again. I’m definitley in for Soweto again next year – just to beat this time! Every single time I am in awe of you! well done!